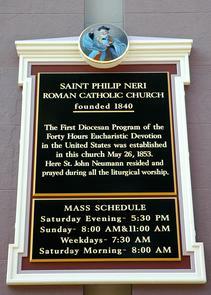 Close up of sign posted outside church displaying mass times and bearing text that reads: "Saint Philip Neri Roman Catholic Church founded 1840. The First Diocesan Program of the Forty Hours Eucahristic Devotion in the United States was established in this church May 26, 1853. Here St. John Neumann resided and prayed during all the liturgical worship." Top of sign also has small color image of St. Philip Neri.